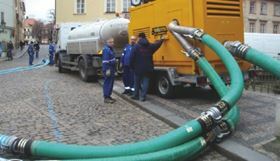 The solution lies in a fleet of 11 off Autoprime QI200 canopied pumpsets and five off XF250 Autoprime pump sets which were co-financed by the EU and the Prague Magistrature following the disastrous flood in Prague in 2002 – and are kept on standby for just such an emergency. Last year, the pumps were utilised on draining of a 20 m crater which suddenly appeared during tunneling works after an extended period of torrential rain. In March this year, after the thaw of a heavy snowfall, they were again deployed to protect the Certova channel, just below the Charles Bridge, where restaurants and commercial buildings were menaced by the high water level in the river. Manufactured in sizes from 4 to 6 ins, each pump from SPP Pumps is complete with a full set of suction and discharge hoses including the suction strainer. These kits, along with the compact and mobile design of the Q series, allow the pumps to be quickly deployed on applications such as this emergency situation. Other benefits making the Q Series pump the perfect choice for use on diÿcult terrain are its overall lightweight construction, mobility and maneuverability, combined with the robust, hard wearing and reliable pump-end. Key to the award winning Q series range is the high level of interchangeability through commonality of parts. The Q series range of pumps covers QHH80 3 in high head, QI100 4 in, QI150 6 in, QI150M 6 in medium head and QI200 8 in with a variety of “add ons”. The special ‘POD’ design of the Q series forms the basic structure, and is the minimum level at which the pump can be supplied. As standard the bunded POD contains the pump, engine, priming system, controls and electrical system. Each POD and pump uses the same chassis, steelwork and doors, bearing housing, twin mechanical seal arrangement, volute (with the exception of the 3 in high head) and priming system. The priming system is also used on many other pumps including the XF250 supplied as part of the Prague Magistrature fleet described above. The benefits of this high level of interchangeability are clear and demonstrate SPP Pumps commitment to the Pump Industry by offering products with a high level of commonality of parts – thus reducing spares holding inventory – and a high degree of flexibility in the pumpset configuration. Whilst not quite as mobile as the Q series, the Autoprime XF High Flow pumps offer superior performance with high flow capability combined with higher head characteristics, providing a very versatile durable pump for applications such as this. The SPP double spiral vane designed impeller also provides for excellent suction lift performance with solids handling up to 4.4 in (110mm) diameter – a very useful feature under the circumstances. SPP has also built excellent low-life cost benefits into the designs to reduce maintenance through the use of quality materials and low fuel consumption.